not the usual scientific owl book. 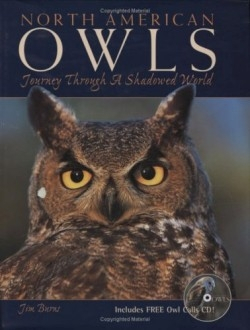 It synthesizes the author’s accounts of many owling adventures with his discoveries and reactions to the birds. nesting sites, habits, habitat range, etc. The chapters are short essays or poem-essays; each provides color photographs exhibiting the features or behaviors of the particular species. mainly informative. Burns’s voice is friendly, and his prose is specific, especially in his attempts to describe the owls’ calls. Consider the “eight-shooter” (eight-syllable call) of the Barred Owl: “Hoo, Hoo, Hu, Hoooo, Hoo, Hoo, Hu, Hooooaaw!” The accompanying CD allows the reader to hear authentic recordings of the calls. elevates the quality of the book and enhances the flow of art and narrative together. for life itself.” While birders are the targeted readers, all nature lovers will find this book worthwhile.